This started out kind of slow (all the jumping around many different POVs took some getting used to), and then it just sort of... exploded. It took a while for me to adjust to how much more... expansive this feels in comparison to Daughter of Smoke and Bone, and how much darker and more harrowing it is. Daughter of Smoke and Bone was about love. And this series will surely always be about love, and the things that love can achieve. 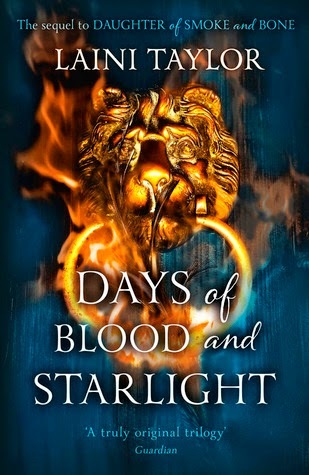 But where Daughter of Smoke and Bone showed the brighter side of things, and was filled with sweetness and joy and happiness and hope, Days of Blood and Starlight introduces the reader to despair, and grief. The landscape of the book is bleak. There is so much death, and pain, and horror. This book shows us how complicated everything really is. It lays bare the realities of war. The despicable lengths that both sides, chimaera and angel, will descend to. We meet many new characters, and we see a lot more of the world of Eretz, the world of these chimaera and angels. Daughter of Smoke and Bone, though it had told of the war, had felt so... narrow, in a way. Not that that was a bad thing, but it was a story very much focussed on Karou and Akiva, on the mystery of their entwined past. But now we realise how much more there is to their story than the two of them. How much must come between them, the new depths of cruelty that the war has reached, the unyielding hatred that is every moment reaching new heights between their two peoples, all the intrigues that lie hidden, unfurling on both sides. How Akiva's vengeance would seem to have burned away any hope that ever existed in his heart, and in Karou's. Any hope of a real future, for them both, and for Eretz. And the pleasure of reading this book is in finding out how that hope can be rekindled. Everything is so much heavier in this book. Karou and Akiva and the burdens they have to carry. They are separated for most of the book, and both are desperately trying to atone for things they believe to be their fault. Karou works in a secret location in the human world with the few chimaera left, becoming their new resurrectionist and taking on Brimstone's job, tithing her pain to build more monstrous bodies for the chimaera forces, better to kill angels with. Akiva works in Eretz with the other Misbegotten, the bastards born of Joram, the seraphim emperor, and their task is to destroy all the chimaera they can find. But Akiva will not. He will try and preserve as many as he can, instead. Karou is so miserable for most of this book, it made my heart hurt to see her like this. Her anger at Akiva is justified and understandable, but oh, Akiva is so GOOD in this book. He is so heroic and stoic and he does so much for her, and he hopes against hope and he saves chimaera and believes that things can be different, believes still in their dream, their dream of harmony with the beasts, or some semblance of that dream, and it is just. So amazing. And the complicated web of their feelings for each other, the palpable pain they both feel at this shattered thing that lies between them... It is just incredible. I have to say, I adore Zuzana and Mik so much and I am so glad for their presence in this book. I love the lightness and humour and warmth they bring. I love how much Zuzana cares about Karou. She's just so awesome! So tiny and fierce and funny and wonderful. And her relationship with Mik is just so sweet and well, uncomplicated. That was sorely needed in a story that was just so very, very complicated otherwise. I also loved Ziri, a new character in this book. A Kirin, like Karou used to be in her past life. The last of the Kirins, in fact. And he was so lovely to Karou. He was just so brave and pure-hearted and it made me terribly sad for him, because he loves Karou so much and Karou is just too embroiled in fighting off her feelings for Akiva to ever fall in love with anyone else. Laini Taylor writes villainy so well. Remember how I said I don't seem to care much for villains, so that they hardly even leave an impression on me most of the time? Well, I'm not forgetting Thiago anytime soon. I absolutely despised him, and fairly seethed every time he appeared in the book. Oh, and Jael. Another terrifying and contemptible and believable villain. And both of them, Jael and Thiago, so horrifically compelling. I am in awe. Just thinking about them makes me shudder. The last 30% was breathtaking. God, does Laini Taylor know how to plot. I was just on the edge of my seat the entire time. Ultimately this was a gripping read, and a very powerful and painful look at war and all its implications. It's very different from Daughter of Smoke and Bone in tone, and contains a lot less romance, though I still really adore all the things this book does have to say about love. If you've read the first one but not the second one yet, be prepared for something much more grim and nightmarish. The prose continues to be exquisite, but the content is a lot more bloody and violent. It's also more exhilarating, in my opinion, and it's just pretty fantastic fantasy. I don't think you could have said it any better! This was probably my favorite of the three books, simply because of how complex and massive the plotting and world-building was. I felt like I was sunk entirely into Eretz and the angel/chimaera war - I had a book hangover for days after finishing it. I've skipped over your review but again, thank you for reminding me of this series with your Tweet :) It pushed me to finally pick it up haha. I'm loving it!